GET THE BRAND NEW ALBUM NOW! "Mammoth melodies, evocative imagery... the band creates discord and sonic chaos that is gorgeously layered into a symphony of pop magic." "A one of a kind listen from an awesome band that refuses to blend in with the crowd." "A treasure chest of musical might... boundless grooves and extraordinary melodies." "An emotional, tightly wound release from a stellar group that has truly come into their own." "A truly emotional, authentic slab of rock n' roll that defies categorization... Skyfactor is a powerful force to be reckoned with." "The musicianship, the production and the performance all knit together beautifully - even brilliantly." "Intelligent lyrics and catchy melodies are the heart of these songs. An awesome album." 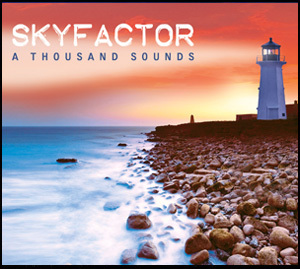 "Skyfactor will sweep you off your feet in a whirling tornado of energy, talent, and the seductive spirit of rock 'n' roll."